Experts say it's hallmark GRU, the Russian military spy agency. 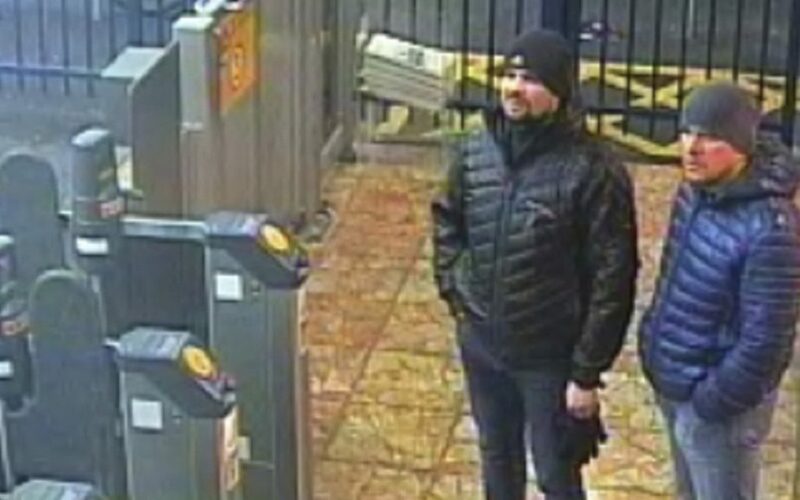 Image issued by London police Wednesday shows Russlans Ruslan Boshirov and Alexander Petrov at the Salisbury train station on March 3. British prosecutors have charged them with the nerve agent poisoning of ex-spy Sergei Skripal. PARIS — It seems like a spy film parody – two burly Russian agents staying in a low-end London hotel and doctoring a perfume flask with a deadly nerve agent, oblivious to the security cameras filming them along the way. The operation to poison ex-spy Sergei Skripal in Britain was either botched, or intentionally obvious. But experts say it’s hallmark GRU, the Russian military spy agency with a brutish reputation that’s increasingly taking on high-profile, high-risk operations to damage Russia’s enemies, or simply strike fear. After British authorities identified two alleged GRU agents last week as the perpetrators, releasing copies of their passports and a slew of CCTV images to back up the accusation, Russian social networks exploded with caricature photos and memes ridiculing the claim. The implication: the GRU would never do something so dumb. Yet the Russian public may never know what actually happened, given the murkiness and myth that have surrounded the GRU since the Soviet era. “No normal Russian citizen has any idea what they are doing,” said independent military analyst Alexander Golts. It’s not the first time that alleged GRU agents have failed to cover their tracks, stirring suspicions that they are trying to send a message. British Prime Minister Theresa May said the Skripal poisoning in March was a possible warning to other Russians in London that they aren’t safe, and threatened to strike back . Either way, the accusations against the GRU fortify Russia’s image as unafraid to protect its interests on foreign soil, at any cost. It also sends the people of Russia a signal that “nobody is safe from the long arm of the Kremlin,” said John Sipher, a former CIA agent in Moscow who ran the agency’s Russia operations. However, the proliferation of security cameras means “it is harder and harder to engage in these activities without getting caught,” Sipher said. The Kremlin calls the British evidence hogwash, along with everything else the GRU has been accused of in recent years – hacking the 2016 U.S. election campaign, trying to stage a coup in Montenegro, downing a Malaysian Airlines plane over Ukraine, running mercenaries in Syria. Wherever the truth lies, the GRU is having its moment. Created in the midst of the civil war that spawned the Soviet Union, the GRU was chastened by Stalin in the 1930s when it grew too brazen abroad, according to military historians. Since then it has operated largely in the shadows, overseeing special forces and listening operations – once by radio surveillance teams, now by hackers, according to Russian military analyst Pavel Felgenhauer. The GRU’s boss reports to Defense Minister Sergei Shoigu, but was named by President Vladimir Putin, a onetime spymaster himself. The agency also cultivated rivalries with Russia’s FSB, which concentrates on domestic intelligence and counterintelligence, and SVR, the foreign intelligence service. “He hated (Hillary) Clinton, and his sense of resentment and anger has grown over the years,” Sipher said. The agency – technically now called the GU, or Main Directorate, but still widely known by its Soviet-era acronym – is increasingly upstaging rival agencies in the public imagination abroad. It was the no. 1 suspect in the March nerve agent attack in the British city of Salisbury against Skripal, himself a former GRU officer who became a British double agent. He and his daughter survived the poisoning, but another local resident died months later from exposure to the same nerve agent. The GRU is accused of a role in the annexation of Crimea and separatist rebellion in eastern Ukraine, and in leading a so-called shadow army in Syria. Alleged GRU agents have been targeted by U.S. sanctions, and 12 were indicted in July in Robert Mueller’s investigation into election meddling, accused of hacking into the Clinton campaign and releasing masses of emails.